airplane flies overhead, in a scene from "Charlie Chan at the Olympics" (1937). WEEKLY CHAT/FILM VIEWING: Charlie Chan at the Olympics starring Warner Oland. Please join us as we discuss this film LIVE as we watch it together via video tape or DVD! WEEKLY CHAT/FILM VIEWING: Charlie Chan in Panama starring Sidney Toler. Please join us as we discuss this film LIVE as we watch it together via video tape or DVD! Manuel Arbo, who would portray Charlie Chan in the film "Eran Trece," the Spanish language version of "Charlie Chan Carries On," is born in Madrid, Spain on this day in 1898. WEEKLY CHAT/FILM VIEWING: The Chinese Cat starring Sidney Toler. Please join us as we discuss this film LIVE as we watch it together via video tape or DVD! WEEKLY CHAT/FILM VIEWING: Charlie Chan in "City in Darkness" starring Sidney Toler. Please join us as we discuss this film LIVE as we watch it together via video tape or DVD! 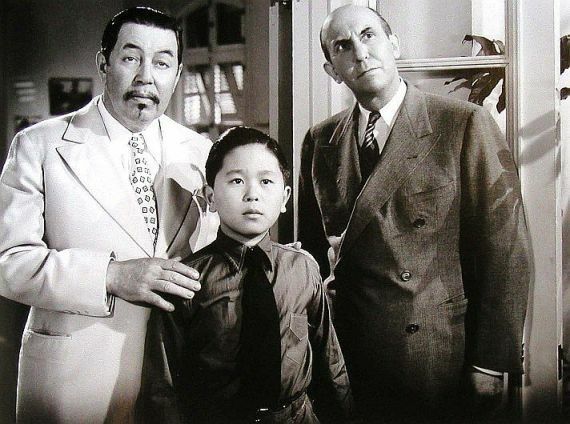 Kamiyama Sojin, who portrayed Charlie Chan in "The Chinese Parrot" (1927), dies in Tokyo, Japan on this day in 1954.